The Mir Space Station was Russia’s greatest space station, and the first modular space station to be assembled in orbit. Commissioned in 1986, the name can be translated from Russian as “peace”, “world”, and even “village” – alluding to the spirit of international cooperation that led to its creation. Owned and operated by the Soviet Union, it became the property of the Russian Federal Space Agency (Roscosmos) after 1991. The space station was intended to advocate world peace and hosted international scientists and NASA astronauts. In this respect, Mir was very much the curtain-raiser for the International Space Station, which succeeded it as the largest satellite in Earth’s orbit after 2001. During the 1960s and 70s, when the United States was largely focused on Apollo and the Space Shuttle program, Russia began to focus on developing expertise in long-duration spaceflight, and felt that a larger space station would allow for more research in that area. Authorized in February 1976 by a government decree, the station was originally intended to be an improved model of the Salyut space stations. The original plan called for a core module that would be equipped with a total of four docking ports, but eventual grew to include several ports for crewed Soyuz spacecraft and Progress cargo spaceships. By August 1978, the plan had grown to the final configuration of one aft port and five ports in a spherical compartment at the forward end of the station. Two would be located at either end of the station (as with the Salyut stations) with an additional two on either side of a docking sphere at the front of the station to enable further modules to expand the station’s capabilities. These docking ports would each accommodate 20-tonne space station modules based on the TKS spacecraft – a previous generation of space craft used to bring cosmonauts and supplies to the Salyut space stations. Work began on the station in 1979, and drawings were released in 1982 and 83. By early 1984, work had ground to a halt as virtually all of Russia’s space resources were being put into the Buran program – a Soviet and later Russian reusable spacecraft project. Funding resumed in early 1984 when the Central Committee became determined to orbit Mir by early 1986, just in time for the 27th Communist Party Congress. On February 19th, 1986, the assembly process began with the launching of Mir’s core module on a Proton-K rocket into orbit. Between 1987 and 1996, four of the six modules were launched and added to the station – Kvant-2 in 1989, Kristall in 1990, Spektr in 1995 and Priroda in 1996. In these cases, the modules were sent into orbit aboard a Proton-K, chased the station automatically, and then used their robot Lyappa arms to mate with the core. Kvant-1, having no engines of its own, was delivered by a TKS spacecraft in 1987, while the docking module was brought to the station aboard Space Shuttle Atlantis (STS-74) in 1995. Various other external components, including three truss structures, several experiments and other unpressurized elements, were also mounted to the exterior of the station over the course of its history. The station’s assembly marked the beginning of the third generation of space station design, being the first to consist of more than one primary spacecraft. First generation stations such as Salyut 1 and Skylab had monolithic designs, consisting of one module with no resupply capability, while second generation stations (Salyut 6 and Salyut 7) comprised a monolithic station with two ports to allow resupply cargo spacecraft (like Progress). The capability of Mir to be expanded with add-on modules meant that each could be designed with a specific purpose in mind, thus eliminating the need to install all the station’s equipment in one module. After construction was finished, Mir had a collection of facilities. At 13.1 meters (43 feet) long, the “core” module of the station was the main area where the cosmonauts and astronauts did their work. It also housed the main computer and vital space station parts, such as communications. In addition to solar arrays and a docking port, the station had several facilities for orbital science. These included, but were not limited to, the two Kvant modules (where astronomy and other scientific research was conducted), the Kristall module (which had a facility for microgravity manufacturing) and Spektr (focused on Earth work). During its 15-year spaceflight, Mir was visited by a total of 28 long-duration, or “principal”, crews. Expeditions varied in length, but generally lasted around six months. Principal expedition crews consisted of two to three crew members, who often launched as part of one expedition but returned with another. As part of the Soviet Union’s manned spaceflight program effort to maintain a long-term research outpost in space, operated by the new Russian Federal Space Agency after 1991, the vast majority of the station’s crew were Russian. However, through international collaborations, the station was made accessible to astronauts from North America, several European nations and Japan. Collaborative programs included the Intercosmos, Euromir and Shuttle-Mir programs. Intercosmos, which ran from 1978-1988, involved astronauts from other Warsaw Pact Nations, other socialist nations – like Afghanistan, Cuba, Mongolia, and Vietnam – and pro-Soviet non-aligned nations such as India, Syria, and even France. Euromir, which began in the 1990s, was a collaborative effort between the Russian Federal Space Agency and the European Space Agency (ESA) to bring European astronauts to the space station. With help provided by the NASA Space Shuttle program, the goal was to recruit and train European astronauts for the then-planned International Space Station. Meanwhile, the Shuttle–Mir Program was a collaborative space program between Russia and the United States, and involved American Space Shuttles visiting the space station, Russian cosmonauts flying on the shuttle, and an American astronaut flying aboard a Soyuz spacecraft to engage in long-duration expeditions aboard Mir. By the time of the station’s deorbit, it had been visited by 104 different people from twelve different nations, making it the most visited spacecraft in history (a record later surpassed by the International Space Station). When it was launched in 1986, Mir was only supposed to have a life span of about five years, but it proved to have a greater longevity than anyone expected. 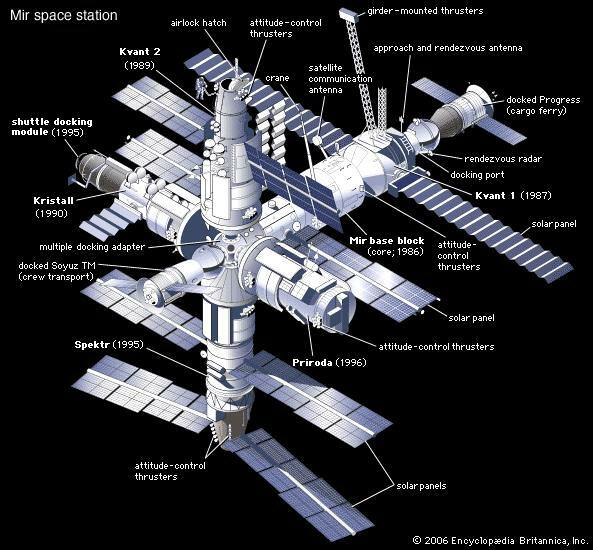 Unfortunately, a series of technical and structural problems eventually caught up with the station; and in November 2000, the Russian government announced that it would decommission the space station. This began on Jan. 24th, 2001, when a Russian Progress cargo ship rendezvoused with the station carrying twice its normal amount of fuel. The extra fuel was intended to fire the Progress’ thrusters once it had docked with Mir and push the station into a controlled descent through the Earth’s atmosphere. The Russian government purchased insurance just in case the space station hit any populated area when it crashed to Earth. Luckily, the station ended up crashing into the South Pacific Ocean, landing about 2,897 kilometers from New Zealand. In 2001, former RKA General Director Yuri Koptev estimated that the cost of the Mir program to be $4.2 billion (including development, assembly and orbital operation). The Mir Space Station endured for 15 years in orbit, three times its planned lifetime. It hosted scores of crew members and international visitors, raised the first crop of wheat to be grown from seed to seed in outer space, and served as a symbol of Russia’s past glories and it’s potential as a future leader in space exploration. In addition, the station was a source of controversy over the years, due to the many accidents and hazards it endured. The most famous of these took place on February 24, 1997 during mission STS-81. On this occasion, which saw the Space Shuttle Atlantis delivering crew, supplies, and conducting a series of tests, the worst fire aboard an orbiting spacecraft broke out. This caused failures in various on-board systems, a near collision with a Progress resupply cargo ship during a long-distance manual docking system test, and a total loss of station electrical power. The power failure also caused a loss of attitude control, which led to an uncontrolled “tumble” through space. Luckily, the crew managed to suppress the fire and regain control before long. Another major incident took place on June 25th, when a Progress resupply ship collided with solar arrays on the Spektr module, creating a hole which caused the station to lose pressure. This was the first orbital depressurization in the history of spaceflight to take place. Luckily, no astronauts were lost while serving aboard the station. Mir is also famous for hosting long-duration missions during its early years in space. Topping the list was Russian cosmonaut Valeri Polyakov, who spent nearly 438 days aboard Mir and landed on March 22, 1995. The station itself orbited the Earth more than 86,000 times during its lifespan, and was also the largest orbiting object in the Solar System. But most importantly of all, Mir served as the stage for the first large-scale, technical partnership between Russia and the United States after a half-century of mutual antagonism. Without it, there would be no ISS today, and numerous joint-research efforts between NASA, the ESA, Russia, and other federal space agencies, would not have been possible. We have written many interesting articles about space stations here at Universe Today. Here’s What is the International Space Station?, Fire! How the Mir Incident Changed Space Station History, The Mir Space Station: An Unlikely Place for a Beautiful Art Exhibit, and Mir’s Fiery Re-entry, March 23, 2001. For more information, check out the Mir Space Station and Shuttle-Mir.